The Zoom Plugin for IBM Notes is designed to make scheduling a meeting in IBM/Lotus Notes quick and convenient. The Plugin allows you to schedule a Zoom Meeting as well as make existing meetings/appointments Zoom Meetings through the IBM Notes calendar interface. The Zoom Plugin for IBM Notes can be downloaded from the Download Center. Zoom offers a direct installer or an Administrative install for Domino Server. “Start trusting the signer to execute this action”. Open a new or existing appointment/meeting from the IBM Notes calendar. Set the time, date, and subject of the event. 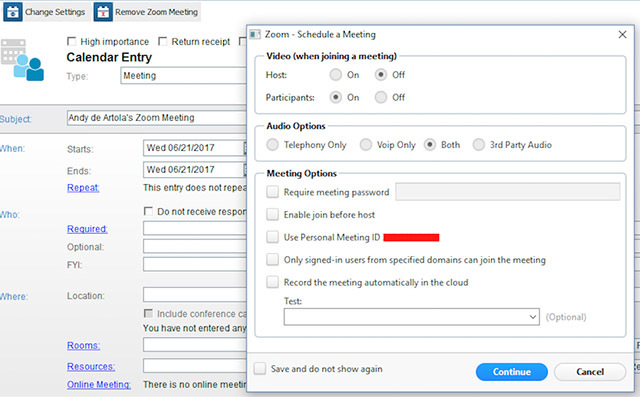 Click the “Add Zoom Meeting” button in order to schedule the meeting for the specified date and time and auto-populate the meeting details into the body of the event. If desired, you can change the settings for the Meeting such as video settings, audio options, and other meeting options by clicking the Change Settings button at the top of the event. You can also remove the Zoom meeting from the event if desired. To do this click “Remove Zoom Meeting” at the top of the event.